Carrie and Chris were married at the bell tower gazebo at Pala Mesa. 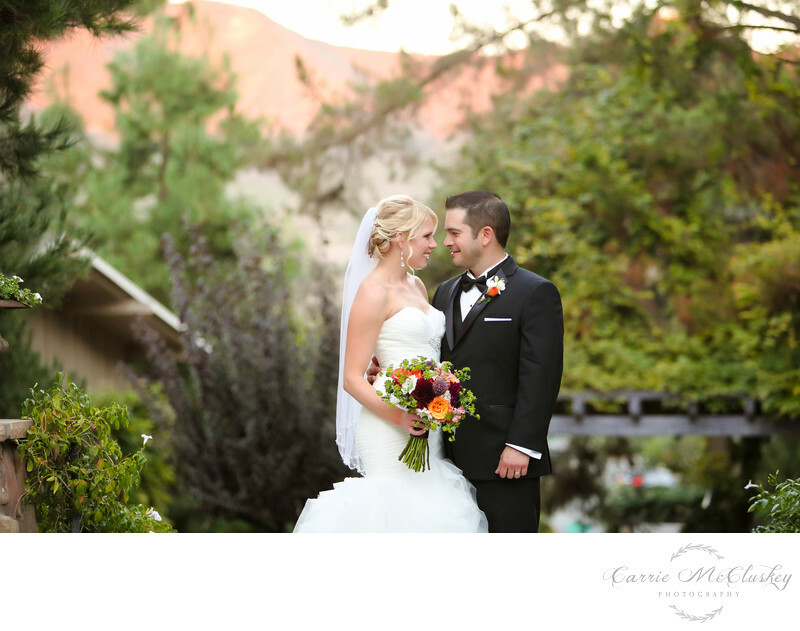 Pala Mesa Resort is a wonderful and gorgeous destination for every Southern California Bride and Groom. According to their website, Pala Mesa is located in the hills of Fallbrook and it is the premiere wedding venue in North San Diego County. In this image bride and groom had just finished their ceremony. They are now married and have finished their family portraits as well as their wedding party photos. This was a Fall wedding and Carrie incorporated many of the autumn colors into her flowers and decor. She even wore feathers on her dress. She used the florist Fern and Vine who did an amazing job at decorating the ceremony site as well as the reception centerpieces. The bride had five bridesmaids and the groom had seven groomsmen. The bridesmaids all carried bouquets down the aisle and the flower girl dropped rose petals as she made her way down the aisle. The ring bearer carried a ring pillow and the groomsmen wore boutonnieres. I really love this image because the couple is so relaxed and in love. You can just see that in their faces. Chris adores Carrie and is was captured in his expression while he is looking at her. We were a little short on time during the bridal photos because they were taken during cocktail hour, however since the location is so pretty, we were able to get many images in a very short amount of time. At Pala Mesa you may choose where to have your wedding ceremony and create your own personalized wedding ceremony itinerary. You may select from a variety of styles or themes for your wedding day. Their wedding took place under a unique Antique Bell Tower, picturesque Rose Gardens and a 30-foot Waterfall. They surrounded themselves with their family and friends at the secluded cliff terrace nestled in the sunset lit San Diego foothills. They celebrated their reception in the gorgeous tent next to the ceremony location. The tent at Pala Mesa is extra fabulous since the ceiling has multiple, glowing chandeliers. Regina from Aqualione events was her wedding coordinator. Carrie chose me to be her wedding photographer because I photographed her sister’s wedding at Rancho Bernardo Inn about three years ago. She really enjoyed my photography and contacted me shortly after she got engaged. I was so happy to photograph this wedding, both Carrie and Chris were a pleasure to work with.Keywords: bride (21), California (75), ceremony (9), course (9), dress (3), Fallbrook (3), Family (168), golf (6), groom (21), Headshots (75), lawn (9), Mesa (3), Pala (3), Photographer (168), Photography (168), San Diego (147), Southern (75), wedding (153), Weddings (12).